Once upon a desert moon there was KYUSS. All that followed them by association and by influence became underground rock history, including QUEENS OF THE STONE AGE and a fuzz-baked revival of acid and garage rock. Fashionable to the point we now hear QUEENS and EAGLES OF DEATH METAL jams on commercial breaks during football games, KYUSS has become a mere addendum to something they helped propagate. Well, not so much that Josh Homme and Scott Reeder (with Homme taking the lead) didn't cry foul by filing a trademark infringement suit against their former band mates who had recently kicked back into action under the moniker KYUSS LIVES! Call Homme's acts heritage preservation or investment protection, yet KYUSS LIVES! is effectively post mortem. Having licked their wounds in defeat, vocalist John Garcia and drummer Brant Bjork have instituted VISTA CHINO along with guitarist Bruno Fevery (ex-ARSENAL and former component of a KYUSS tribute band) and band family figurehead Nick Oliveri, whose future involvement remains suspect at this point. Albeit, John Garcia has given Oliveri status of "honorary member" for his bass contributions to the new incarnation, which rolls on as a three piece unit on paper. Substituting for Oliveri on the road is C.O.C. 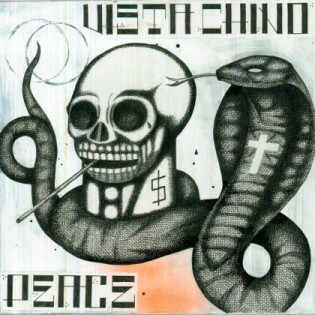 bassist Mike Dean, who also played on one track, "As You Wish", for VISTA CHINO's debut recording, "Peace". As the comically-titled "Peace" quickly asserts itself with the bobbing knockout tracks "Dargona Dragona" and "Sweet Remain", this is a KYUSS album straight down to the buzzing echoes, dustbowl distortion and galumphing beats. Those who might've been disappointed in the new QUEENS OF THE STONE AGE album "Like Clockwork" will probably find refuge in VISTA CHINO's unabashed recreation of, well, you know who. John Garcia's pitches have hit a higher decibel, coupling a tendency to shriek with his trademark lulls, while Brant Bjork's laidback presence causes him to pitter-patter at times ("As You Wish", for example) and to knock down earthy percussion rails ("Sweet Remain" and "Barcelonian"). Bjork also fields bass on the tempered space toaster drives of "Planets 1 & 2". Bruno Fevery, who's obviously had plenty of time re-enacting Josh Homme's wah-slobbered chops in the past, sells a handy illusion for VISTA CHINO's purposes. Fevery keeps his business strictly in the interest of filling a void. Call Josh Homme a hero or a cad, he's still one of the best of his ilk. Fevery glides and yanks note jerks overtop the trippy grooves of "Planets 1 & 2" and keeps a sliding verve alongside Nick Oliveri on the breezing verves of "Sweet Remain" and "Adara". Fevery is the fret-wriggling star on the shuffling and jam-minded "Dark and Lovely", even as John Garcia restrains his vocals to whispering plugs and slightly-elevating soul kisses. Nothing on "Peace" is remotely within reach of "Blues for the Red Sun" or "Welcome to Sky Valley", but one gets the impression an injunction would be slapped back in Garcia and Bjork's faces if this album managed to accomplish that feat. The instrumental "Mas Vino" gets daringly close with its knuckle down bass loads and Hendrix-esque blues noodling, but its short run seems more like a fleeting raspberry cast toward their conquerors (more so Homme, it would seem) than any attempt at hijacking the legacy. With the 13-minute-plus closer "Acidize - The Gambling Moose", VISTA CHINO locks themselves into a creative space that sees them chuck along for a few bars then strip down for another few before amping back up with some of the loudest riffs on the album. The track then clomps like a madman fresh out of tar in the middle portion, and hits a slow dirty boogie segment where original KYUSS bassist Chris Cockrell drops by with a few harmonica lines. Keeping a sluggish plod through the rest of the lengthy ride, this is the heaviest portion of "Peace". What's best about "Peace" is that it simply lets things ride in the expected key while John Garcia and Brant Bjork take noticeable comfort Bruno Fevery has the abilities to help KYUSS live, at least in a figurative state.